Located in the heart of Show Low, Arizona, the friendly staff of AZ Construction Staffing has been serving Arizona for over 20 years. When it comes to hiring the right people for the right job, you can count on a quick response time. We have a wide selection of jobs and employment resources which includes payroll services, background checks, hiring, job advertising, and so much more. When working with AZCS you can always rely on integrity and professionalism, guaranteed. Myth 1: I will be charged money to work with an employment agency. Employment agencies are hired by companies to help them fill job openings. These companies pay the employment agency to find and recruit top talent for permanent and temporary positions. There is no cost to you when you register with, work with, or are hired by an employment agency. Period. Companies hire employment agencies because the best ones have access to top talent, additional resources, expertise, and the flexibility that a company may not have when hiring positions on their own. Myth 2: Employment agencies don’t care about my satisfaction or personal growth. While this may seem true with some agencies, there are many employment agencies that do care about your happiness and personal growth. You should expect an employment agency to help you develop the skills, training, and certifications necessary to get the job you are looking for. Additionally, an agency should review your resume and provide career coaching. Myth 3: Employment agencies don’t have positions I would be interested in. Employment agencies find jobs for people in nearly every industry, job, and type of company. 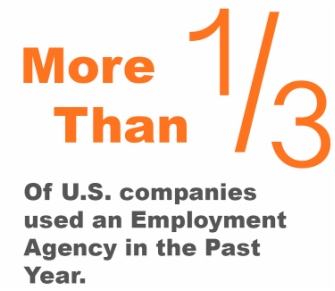 In 2012, more than one-third of all companies in the United States had used an employment agency at some point in the past 12 months, and within the Fortune 500, usage of employment agencies was even higher. An employment agency’s knowledge of your industry and the type of position you are looking for are the most important indicators in finding a firm that can help you. You can find the right agencies at industry specific functions by asking them what companies they work with, and by searching online for agencies that post jobs you are interested in. ​permanent position. While many of the job openings that employment agencies fill are temporary, a significant portion of those positions turn into full-time, permanent employment. 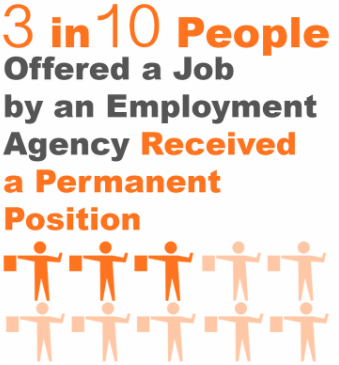 Studies show that roughly 3 in 10 people who were offered a job through an employment agency received a permanent position. Myth 5: If I use an employment agency, I don’t need to use other resources. Employment agencies are a valuable resource throughout your job search and your career. However, they are just one aspect of your approach when finding a job. You should continue to search using other available resources such as your personal and professional network, local and national online job boards, and industry associations. If an employment agency discourages you from these other resources, use caution. Top agencies will want to help you find a job regardless if it’s through them or not, and will help you identify additional resources. About the above guide: The information above is based on research conducted by Inavero, a professional research firm that administers more staffing agency client and talent satisfaction surveys than any other firm in the world. Inavero’s team reports on satisfaction surveys from more than 500,000 staffing agency clients and talent each year and the company serves as the American Staffing Association’s exclusive research partner. All logos are registered trademarks and property of the respective entity.